A historic event at the Indianapolis Motor Speedway during the month of May, Carburetion Day is the final day tune-up for drivers and teams readying to run Sunday’s Indianapolis 500. In the modern era at the Brickyard, the day is simply known as Carb Day (not to be confused with some event rebel dieticians organized against Atkins). For 2011, the all-so important Miller Lite Carb Day at the Indianapolis Motor Speedway offers only a tight one-hour track time session for 33 IZOD INDYCAR Series Honda-powered Dallaras. On the 104-year old 2.5-mile track Friday, every driver made an effort to break in their racing setups for the big 500-miler. Unlike practice leading up to qualifying where only 4-laps of speed was needed, IZOD INDYCAR teams were intent on zeroing in on finding consistency for a 200-lap race distance on Miller Lite Carb Day. Nonetheless, track times through the practice session would continue to demonstrate what car would be the force to be reckoned with for the 100th annual Indy 500. The last time to send a message to other teams ahead of the 2011 Indy 500, some veterans at the Brickyard took advantage of Carb Day practice to assert some strength against newer comers wanting to drink the milk of Indianapolis Motor Speedway’s victory lane. Fastest on Friday, the Target-Chip Ganassi Racing pairing has revealed to defending Indy 500-winning squad will likely be a threat again in 2011. 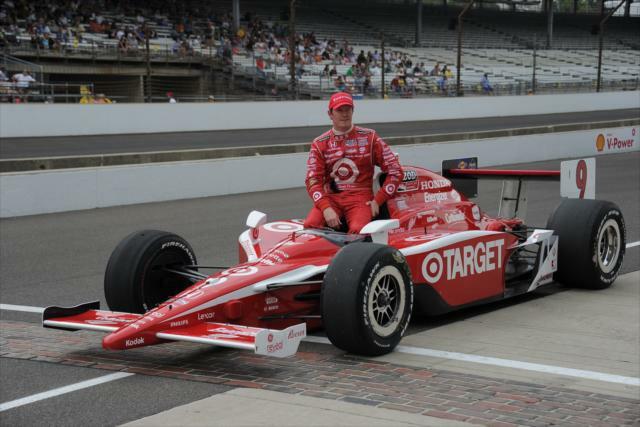 New Zealand’s Scott Dixon, front row qualifier and 2008 Indy 500 champion, stormed to the fastest time around the 2.5-mile track. Lapping at a fastest time of 225.474 miles per hour, Dixon and the #9 Target car served up some retribution against the Sam Schmidt Racing team’s #77 car that prevailed over Chip Ganassi Racing on last Saturday’s Pole Day qualifying. Second fastest but prepared to translate qualifying success into race day speed, 2011 Indy 500 polesitter Alex Tagliani clocked a time about 13/100th slower than Dixon. Giving favourable odds to Alex Tagliani, 20 times the Indianapolis 500 race has been won by a driver capturing the pole position. The 2010 Indianapolis 500 winner Dario Franchitti was third in the Car Day session just 14/1000th of a second slower than Tagliani’s #77 Sam Schmidt Racing car. Rounding out the top-5 in Miller Lite Carb Day practice is Vitor Meira driving for AJ Foyt Racing and Dan Wheldon piloting a one-off entry for Brian Herta Autosport at Indy. Meira and Wheldon were the runner-up finishers of the last two Indianapolis 500 races when they drove for Panther Racing in their respective years. With three Canadian drivers making the grid for the 2011 Indy 500, Quebec’s Alex Tagliani experienced the most publicity on virtue of scoring the pole for Sunday’s major race. Also fielded in the Indy 500 is West Hill, Ontario native Paul Tracy starting 25th in car provided by Dreyer & Reinbold Racing. Completing 47 laps on Carb Day practice, Tracy’s fastest time ranked 17th on the overall ranking. The third racing Canada, Indianapolis 500 rookie of the year candidate James Hinchcliffe from Toronto, Ontario, will start 13th on Sunday at the Brickyard but encountered troubles finding speed Friday finishing the session 25th fastest. In the rookie bunch that includes 5 drivers making their first start at the Indianapolis Motor Speedway’s historic 500 mile race, the Panther Racing driver JR Hildebrand posted the fastest time in 11th place on the speed chart. Following the results of Bump Day at the Indianapolis Motor Speedway on Sunday, one story of the early week was the angling Andretti Autosport performed in entering one of their two drivers who failed to qualify for the 2011 Indy 500. American Ryan Hunter-Reay was initially set to sit out the race until a deal was made with AJ Foyt Racing. Described as a business decision with the #41 AJ Foyt Racing car, Brazilian Bruno Junquiera was relieved in favour of the full-time IZOD INDYCAR Series driver Hunter-Reay. On the race track Friday, Ryan Hunter-Reay performed the 7th fastest time in the session as the American will have to charge from the 33rd starting spot on Sunday to become a factor in the Indy 500. Proving how important track time in preparation for Sunday’s Indianapolis 500 is to teams, all but three INDYCAR teams circulated the track for more than 30 laps within the one hour period. Between the 33 cars running for Carb Day practice, 1,406 laps were recorded.